New Delhi: The government plans to warehouse stressed power projects totalling 25,000 megawatts (MW) under an asset management firm to protect the value of the assets and prevent their distress sale under the insolvency and bankruptcy code till demand for power picks up. State-run Rural Electrification Corp. Ltd (REC) has identified projects with a total debt of around ₹ 1.8 trillion as part of the scheme, which is under government consideration and has been tentatively named Power Asset Revival through Warehousing and Rehabilitation, or ‘Pariwartan’, said a government official aware of the plan, requesting anonymity. The proposed plan also aims to stem the rise in bad loans in the power sector. 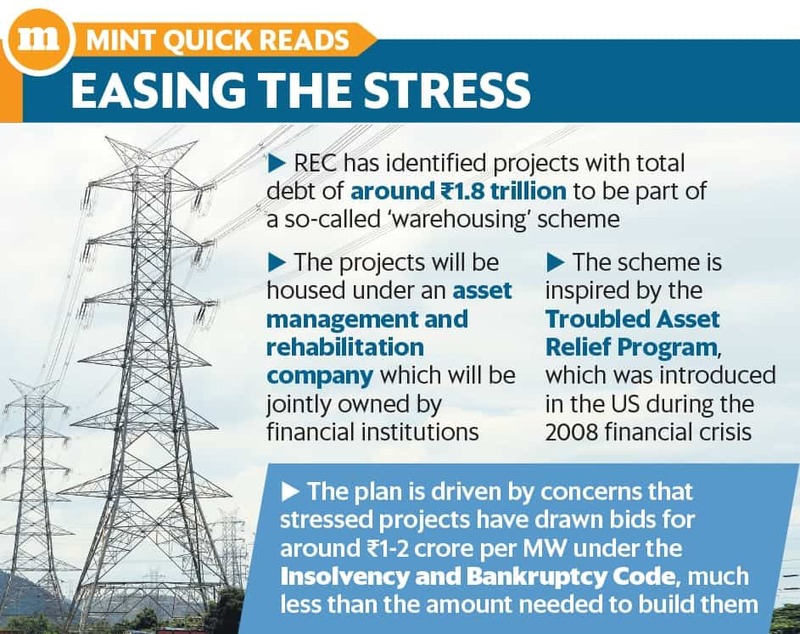 These stressed power projects will be housed under an asset management and rehabilitation company (AMRC) that will be owned by financial institutions. The plan is being driven by concerns that stressed projects have drawn bids for around ₹ 1-2 crore per MW under the insolvency and bankruptcy code, a fraction of the ₹ 5 crore per MW needed to build them. While the promoter’s equity will be reduced to facilitate a transfer of management control to the financial institutions, the lenders will convert their debt into equity. The AMRC will manage the projects and may ask utilities such as NTPC Ltd to operate and maintain them. The AMRC will charge a fee and help complete projects that are stranded for lack of funds. “These projects will be transferred to the AMRC at net book value, wherein it will own a 51% stake in the projects and the balance 49% will be held by the lenders," said the government official cited above. Issues faced by the stressed projects include paucity of funds, lack of power purchase agreements and fuel shortages. Queries mailed to spokespersons for the power ministry and REC on Tuesday evening remained unanswered. Power minister Raj Kumar Singh had mentioned the plan proposed by REC on 5 June at a press conference in Delhi. With promoters losing interest, the value of these assets is deteriorating due to lack of operations and maintenance, added the government official. “With no fresh investments in thermal power, once demand kicks in, driven by a strong economic growth and schemes such as Saubhagya, these assets will be back in play."